Say what you like about Barack Obama in regards to policy and experience but at no time can you challenge his ability to rivet an audience, both on television and live, as he did tonight. In regards to the now Democratic candidate, his speech not only was riveting but also answered questions his critics have been asking for months. Laying out plans and policy for his presumptive presidency was not only brilliant but perfectly delivered. Rationalization and understanding will sweep away naivety upon how he will carry out the plans. I think of myself as an intependent and attempt with all of my ability to not attach myself in any way to the two major parties. I despise the ridiculousness of partisan politics in America and believe that it is the single biggest reason we, as Americans, see very little getting done in Washington and in our respective regions. I hope for an election where we don't have to play a game, voting for someone who for all intensive purposes, is only out to win the election. I hate the direction the parties have taken this country in and hope for it change. In Obama I do see a difference. But I am not naive in realizing that he is a Democrat, with a capital 'D'. Obama is a politician but has not had the 'pedigree' of a politician, as he said tonight. I respect his upbringing, his background and the initiative he has taken in his life to serve rather than gain from people. I am a fan of John McCain, as an American and as a war hero. I am eager for a debate between these two contrasting characters. I have no idea who the protagonist is, let alone the antagonist if there is one. I am only addressing Obama tonight because of the eloquent and dazzling speach he gave tonight. It was a speech that was planned but at the same time carried out with heart toward the American people, whom I felt he truly cares about. I saw a difference in him tonight from the others that have graced the stages in the past few years. I saw someone who has a plan, is ready to carry it out and is grateful to be in the position he is. He was a breath of fresh air for non-partisan politics and I can't wait to hear more. Is this guy unreal or what? Six events, six gold medals and six world records. At this point with one individual event (100 butterfly) left I don't see anything stopping him from taking home what he sought out to get. At this point I'm in awe every time they talk about Phelps and as his name fills up talk radio across the country I know I'm not the only one who is watching. Heck even Ocho Cinco is watching but he thinks he can beat Mr. Phelps. 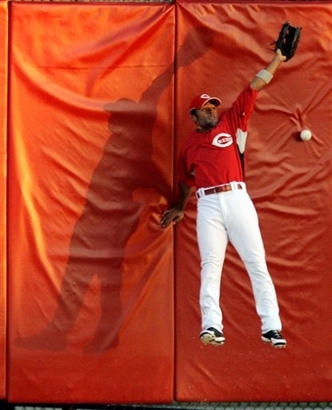 In other news, baseball season is over. Oh, it is still going on, well I forgot after that baseball team in Western Ohio decided to cash in their chips at Argosy before August even started. 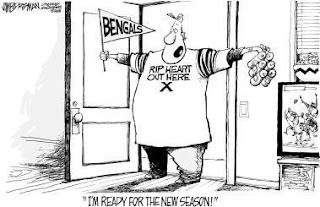 But from death there is life and with the prospect of football on the horizon, I can rest assured the Bengals won't let me down as much as the Reds did. You expect it from them. It's football season again and more importantly its fantasy football time. I've taken the time to pour over stats and projections, sleepers and can't miss rookies and I think I have some advice that might be beneficial to your draft no matter what type of league you are in. The running back world has been taken over by LaDainian Tomlinson for the past few years but with an influx of talent the gap is diminishing between some of the top level backs. With the emergence of Adrian Peterson and this years version Darren McFadden along with others including Steven Jackson (Rams), Joseph Addai (Colts), Brian Westbrook (Eagles) and others, this will be an interesting year with the RB field being plentiful. Even more plentiful may be WR with Randy Moss again leading the pack after a 23 TD year last year. Don't expect a repeat performance but with a little luck he could get near 17 again. Last year Braylon Edwards (Browns) lived up to his no. 3 overall selection out of Michigan and caught 16 TD and looks to be dangerous enough to perhaps catch 20. Targets like Larry Fitzgerald (Cardinals), Terrel Owens (Cowboys) and Reggie Wayne (Colts) are almost guaranteed studs, while Andre Johnson (Texans), Marques Colston (Saints) andBrandon Marshall (Broncos) to move up to the next level of elite receiver status. Even the TE field is deeper than previous years with different projections coming from all over the place. The largest consensus is that Antonio Gates (Chargers) is still the top of the heap but with guys like Jason Whitten (Cowboys), Tony Gonzalez (Chiefs) and Kellen Winslow (Browns) there are more options than in previous years. Quarterbacks remain about the same with a few exceptions including the emergence of the potent Cleveland offense and the surprise arrival of Derek Anderson, which many will pay a lot for. But with plenty of targets including newly signed Donte Stallworth the Cleveland offense has the potential to be the best in the NFL. Tom Brady and Peyton Manning are the only elite QB at this point with Carson Palmer (Bengals), Drew Brees (Saints) and Ben Roethlisberger (Steelers) being very viable options. As far as kickers go none should be better than Stepen Gostkowski (Patriots) but Nick Folk (Cowboys) should get plenty of opportunities. A few guys to keep your eyes on and perhaps pay a round higher than you would normally think are below. Julius Jones (Seahawks) Will probably become premier back after leaving Marion Barber III's shadow in big D. Will battle through the remainder of training camp with Maurice Morris. Michael Turner (Falcons) Finally out of LT's shadown Turner has poster very high numbers in yards per carry forever and should be watched very closely. Could be a superstar. With all the hoopla surrounding Darren McFadden he is set up for failure even if he plays moderately well. However, there may be some sleeper options in terms of rookies and many think that McFadden might NOT even be the best rookie rusher. Darren McFadden (Raiders) -- the backfield in Oakland will be crowded but McFadden seems to be the next heir to the bulk of carries but watch out as there are many options for the Raiders. Johnathon Stewart (Panthers)-- Perhaps the best rookie rusher and someone that will get a large bulk of carries with the under-acheiving DeAngelo Williams alongside. Stewart is a power back and will get a lot of goal line carries. Kevin Smith (Lions) -- Even though he went to a small school is stats were impressive (2,567 yds 30 TD, last year) and has the tools to be a rookie-of-the-year candidate. Matt Forte (Bears) -- has the inside line at the starting job and averaged 200 yds per game last year in college. Rashard Mendenhall (Steelers) Could be the heir apparent to a declining Willie Parker in Pittsburgh. Was a stud at Illinois last year in big games and had 19 TD. So, after a long break, I'm back and ready to report. Just wanted to let you know that I didn't forget about this. Watch the Olympics tonight, not the Cubs game. 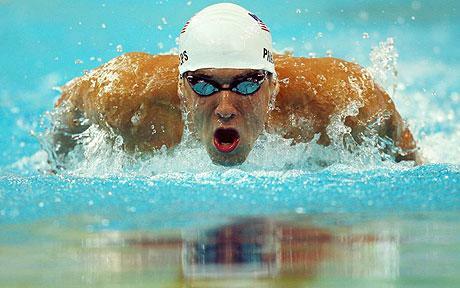 Phelps goes for Gold no. 2.